Staff Sergeant Scott Nicholas joined the United States Marine Corps in 1994 in the Delayed Entry Program under the Marine Corps College Fund program. The DEP is a program under which an individual may enlist in a Reserve or Inactive Component of a military service, and specify a future reporting date. In December of 1994, Nicholas arrived in Parris Island, South Carolina and was placed in Platoon 2069, Hotel Company, 2nd Recruit Training Battalion for boot camp. After graduating boot camp, Private First Class Nicholas was sent to Marine Combat Training at Camp Geiger, North Carolina, and then to the Automotive Organizational Maintenance Course at Camp Johnson, North Carolina. While stationed there, he was promoted to Lance Corporal and deployed to Thailand for Cobra Gold/Freedom Banner. Lance Corporal Nicholas returned to the states in October 1996. He was stationed with the 2nd Assault Amphibian Battalion, 2nd Marine Division in Courthouse Bay, Camp Lejeune. During this time, he was promoted to Corporal and Sergeant. After serving as a motor transport mechanic, Sergeant Nicholas made a lateral move to geospatial intelligence. From April to November 1999, he was stationed at Fort Belvoir, Virginia, at the Defense Mapping School, before transferring back to Camp Lejeune where he was stationed with the 2nd Intelligence Battalion, 2nd Marine Expeditionary Force Headquarters Group. Sergeant Nicholas was there from November 1999 to June 2003. He deployed with the 24th Marine Expeditionary Unit Special Operations Capability. During this time, he was promoted to Staff Sergeant. He then redeployed with Task Force Tarawa in 2003 for the initial push into Iraq. He was with that unit from January 2003 to June 2003. From July 2003 to June 2006, he was stationed with the Defense Intelligence Agency. From August 2006 to 2009, Nicholas was assigned to Korea numerous times with the 3rd Intelligence Battalion, and from July 2009 to November 2010 with the 2nd Intelligence Battalion. He was awarded the Joint Service Commendation Award in 2006, Joint Service Achievement Award in 2006, Marine Corps Good Conduct Award (in 1997, 2000, 2003, 2006 and 2009), and the Navy Marine Corps Achievement Award in 2009. He is also the recipient of the Navy Presidential Unit Citation, Joint Meritorious Unit Citation, National Defense Service Medal, Global War on Terrorism Expeditionary Medal, Global War on Terrorism Service Medal, Korea Defense Service Medal and the Sea Service Deployment Ribbon. 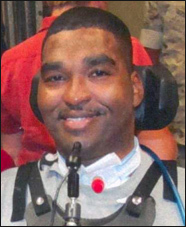 In November of 2010, Staff Sergeant Nicholas was paralyzed from the shoulders down in a motorcycle accident in Jacksonville, North Carolina. His wife Yolanda and children Tessa and Scott, Jr. have been at his side while he has gone through rehabilitation and recovery. Building Homes for Heroes will be gifting Staff Sergeant Nicholas a home in Riverview, Florida in 2016.